GLADSTONE, Ore. – A mother is giving her 7-year-old daughter medical marijuana to help in the treatment of a rare form of leukemia. Mykayla Comstock will undergo chemotherapy for the next three years. Her doctors diagnosed her with cancer this summer. Her mother, Erin Purchase, decided she didn't want to give her daughter the anti-nausea and pain relief medicine a cancer patient would normally take. 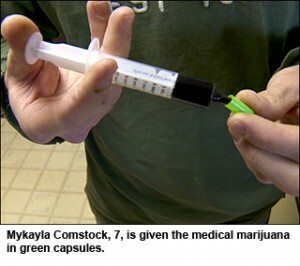 While the whole house smelled like pot, Purchase and her boyfriend, Brandon Krenzler, insisted Mykayla doesn't smoke the marijuana; instead, they give her marijuana oil, one gram every day, injected into capsules. Otherwise, she would take seven to 10 prescription drugs a day, Krenzler said. "She is happier. She has more energy. She is eating like she used to. She doesn't have a lot of nausea," said Purchase. "Our first oncologist wasn't accepting of it. She felt it was inappropriate for Mykayla and pretty much any child." While many may think it is inappropriate, it's not against the law. There is no age limit to be a medical marijuana cardholder in Oregon. For those under 18, children just need their parents' permission. Purchase said she respects the views of those who disagree with what she's doing. But, "what I say back to that, and feel strongly, is cannabis may be inappropriate for a 7-year-old, but ultimately cancer is inappropriate for a 7-year-old," she said. "If she wasn't using cannabis, she'd be using the narcotic pain relievers and anti-nausea drugs from pharmaceutical companies that every other adult would be using for cancer." There are nine other patients under age 14 who are also enrolled in the state's medical marijuana program and a total of 50 children under age 18. Purchase said her family is split over the issue. Mykayla's grandmother is strongly against it and so is her biological father in North Dakota. But Purchase said he doesn't have custody so he would need to go to court if he wanted to intervene.